Hey Traildriver: I guess pay-toilets is a way of getting extra money like Baggage fees on US Airlines. Of course on a low-budget airline you get what you pay for. What's nest, charging for coffee cans for those who don't want to pay for the toilets? I never thought of Old Looks and theological discussions in the same vein, but...enjoy! To the well educated in such matters the bus in the image below appears to be a GM TDH 4512 built sometime between 1953 and 1959 but it is not! - it is, however, a 1952 TDH 4509 that operated as an Airport Connection for the Toledo Area Regional Transit Authority (TARTA). While our focus does have many of the obvious 4512 exterior elements including the plastic GM badge under the windshield, the side directional signals under the first passenger windows (which, in this case, were after market) and the updated Diesel fresh air intakes over the rear quarter sashes, it does not have factory directional signals which were required and standard equipment on all 4512's. The answer as to why this happened, and only with late model 4509's and 5103's is simple; the 4512's and 5105's that followed in 1953 were basically gussied up 4509's and 5103's with the addition of Air Suspension and I suppose that GM engineers decided to do a little redecoration on the last of the old models - a very unusual move especially for GM who had a penchant for strict model designations that changed only with new style or major mechanical alterations. So, the next time you see a 4509 make certain that it's not really a 4512 and vice versa. BTW; someone should have hinted to TARTA's mechanics that the stainless steel wings below the windshield were adjustable in and out from under the GM badge plate to provide correct placement of the directional signals! (I guess I should have been there at the time!). 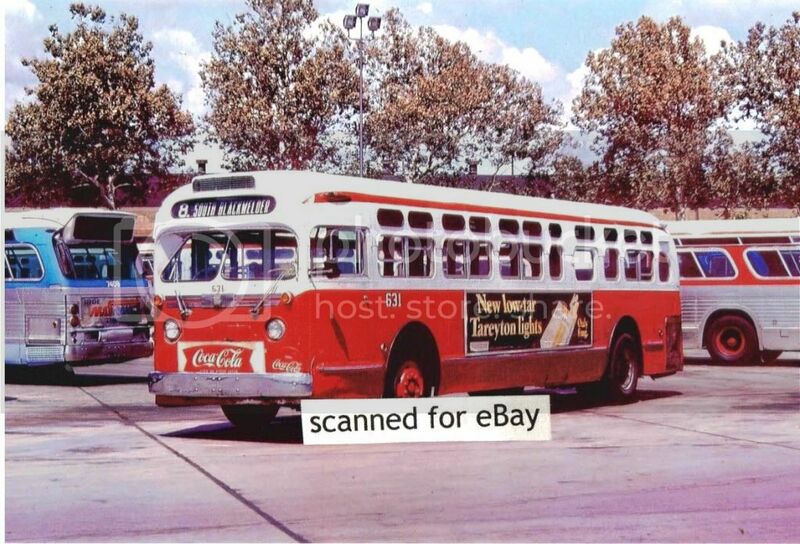 Photo courtesy of '4509bus' and was sold on eBay. I never knew about those subtle differences between a 4909 and a 4912 other than the suspension. Sometimes, but not always, I've noticed because of the air suspension, that the bus seems to sit higher over the wheelwells, especially at the rear with more space between the top of the tire and the well rim. Once again, thank you Mr. L for that bit of knowledge. I learned something new today. 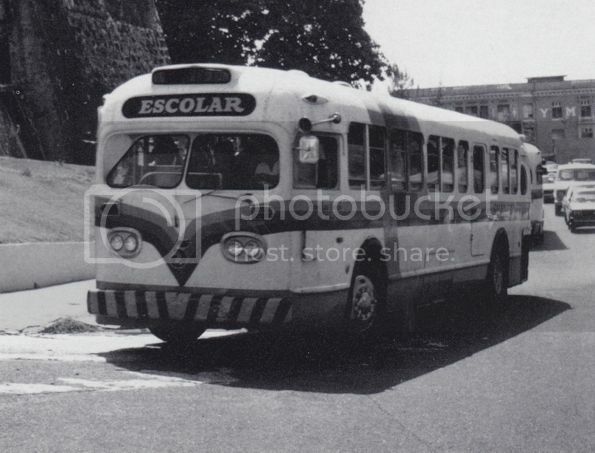 In keeping with the subject at hand, we will now segue to the following photo of Silva Bus Line #5 on a school run. Silva is one of several smaller systems operating in and around the San Juan, Puerto Rico area using a mixed fleet of suburban old looks numbered from 1 thru 23 - all ex-TNJ coaches. 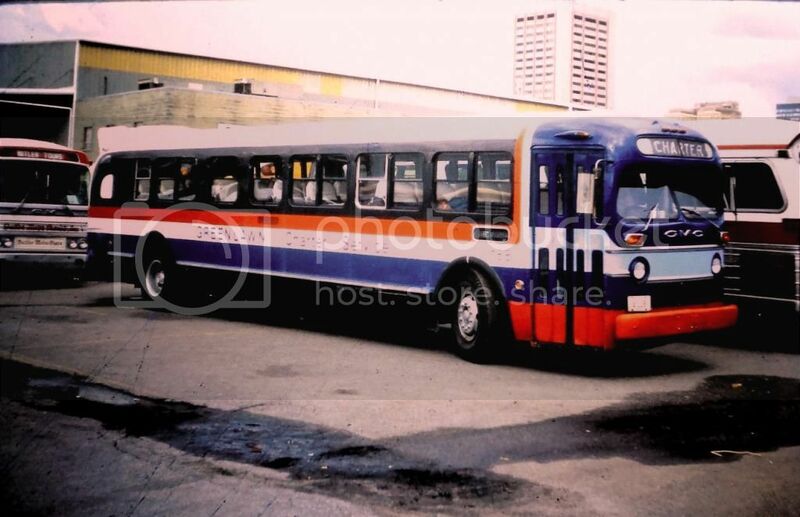 Bus #5 is either a TDM-4509 or a 4512 according to the caption. Any guesses? 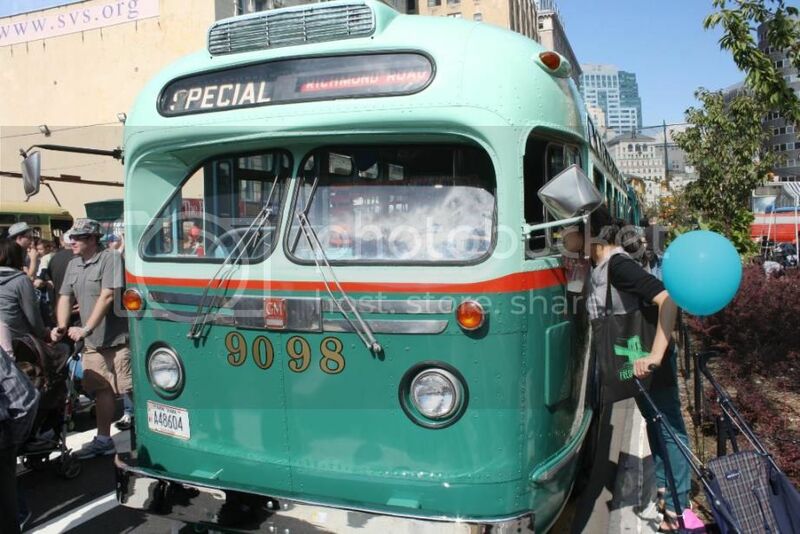 I believe this is the only bus in the fleet to modernize with new duel headlamps taken from a Fishbowl, perhaps as an experiment before deciding not to follow through with the others. Another oddity is the single airhorn! Personally, when compared to the duel headlight TDH-3501 and 3502, the last of the old look models, those "new look" headlights have a cleaner fit with the body panel making them look more natural. Seen in September of 1977 at its company yard is fleet # 631 - a 1959 45 passenger GM Coach modeled as a TDH 4512 and one of thirty six likenesses originally numbered C601 to C636 and purchased in increments between 1957 and 1959 by City Bus Company of Oklahoma City, Oklahoma but transferred to the newly formed Central Oklahoma Transportation and Parking Authority in 1966. The one glaring oddity on # 631 are the very rare pantographic windshield wipers which, unlike the standard arc sweeps, keep the blades in a vertical position throughout each cycle thus assuring wide corner to corner coverage. Note that far longer arms are needed for the system with the placement of the transmissions below the decorative chromium wings under the windshield (see closeup of a New York City TDH 5106 windshield so equipped below). It might be interesting to note that in production of GM's first generation 'New Look' line (1959 to 1963) pantographics were used extensively but dropped in favor of arc sweeps thereafter. Upper photo courtesy of '4509bus' and is available at eBay as item # 371136807090. Lower photo borrowed for educational purposes only. The focus of our study below could be called an oddity in its own right merely because it was one of only fifteen of its ilk ever built with all being delivered in September of 1952. Seen at its company yard sometime in the seventies is fleet #188 - a 1952 51 passenger GM Coach modeled as a TDM 5107 and operating for Greenlawn Charter Service of Columbus, Ohio. The obvious oddity, of course, is the 'GMC' badge similar in style to what was used on the GM PD 4106 and on school buses of the era that were built on GM chassis - additionally, a narrow full width molding can be seen under both the directional signals and headlamps - a reasonable treatment to replace the bland front left by ex owner Public Service Interstate Transport of New Jersey (PSITNJ) when they removed their familiar custom logo and wings under the windshield. Of further note on #188 is a roof mounted air conditioner and an on board lavatory as evidenced by the blocking of both the aft half of the aft most passenger window and the lounge seat quarter sash. GM jumped the gun in building the 5107 with the Air Suspended 5108 already in the wings but probably did so at the prompting of PSITNJ who was a large customer and who bought ten of the fifteen built. Photo courtesy of 'tysghd59b' and is available at eBay as item # 311214585698. You sure that the company operated out of Columbus Ohio and not my old stomping grounds of Greenlawn, New York ? Would have loved to park that gorgeous bus on my 70 foot driveway for two reasons. 1 - If it snowed all I would have to do is drive it into the street and I'd have a shoveled driveway. 2. - It would have pissed off a neighbor who deserved it. Are you sure that the company operated out of Columbus, Ohio and not my old stomping grounds of Greenlawn, New York? 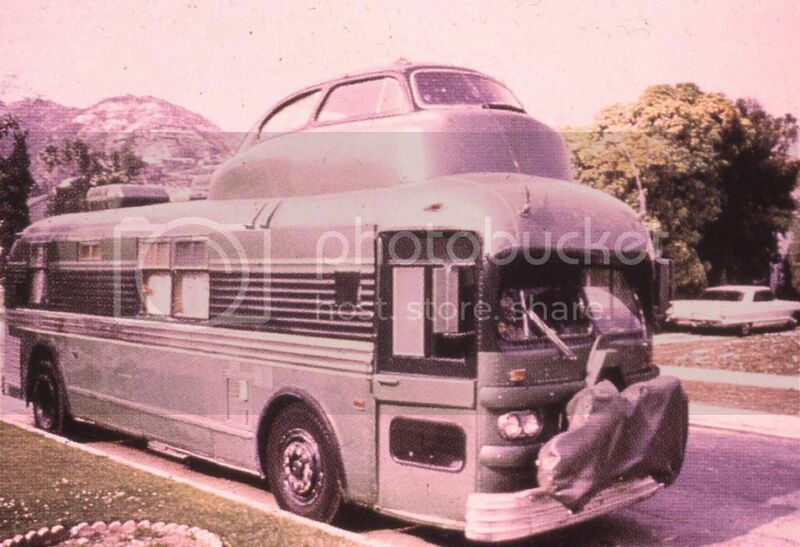 I would have loved to have parked that gorgeous bus on my 70 foot driveway for two reasons. It's unquestionably Columbus, Ohio and the company is still active giving its address as 1640 East 5th. Avenue in Columbus. I first thought that it might have been Greenlawn, N.Y. but then I said to myself; "who, in their right mind, on Long Island would paint a bus in that combination of colors?" - I guess it's different strokes for different folks! I do like your snow cover idea. BTW; tonight at the dinner table we place bets on which Chanukah candle will be the last to burn out - a tradition in my family in which I never come up the winner! Unfortunately, I can tell you a lot more about the 62 Cadillac Coupe De Ville sitting in the driveway (top right of frame) than I can about our focus except to say that it appears to be of GM Old Look origin judging almost solely by its signature windshield and, adding the dual headlamps, might make it a light duty Hydramatic model. Taken in Europe sometime in the seventies, this conversion job is probably one of the most ridiculous you'll ever see and the appendage sitting on the roof in the form of what could be the top of a Nash 'bathtub' of the fifties makes it even worse looking. And, if you thought a GM Old Look looked funny without a Thermo-Matic intake over the destination sign, how about one where the destination sign itself is missing? I do like the pantographic windshield wipers though. 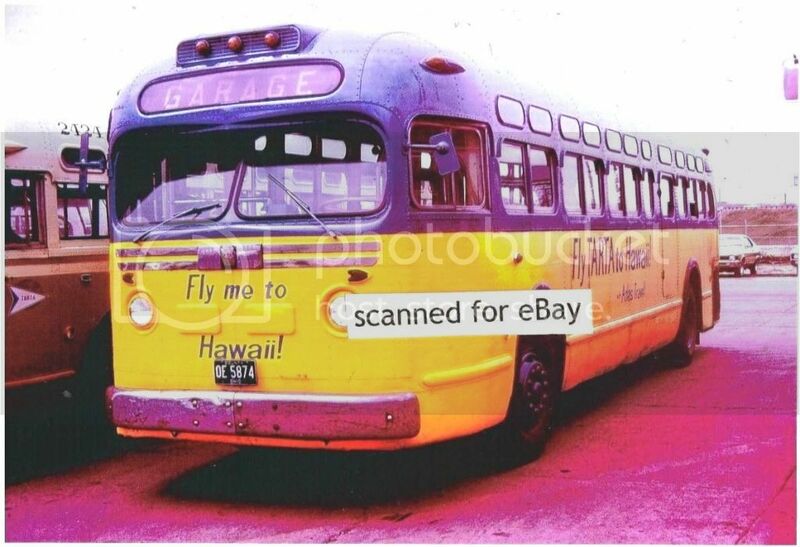 Photo courtesy of 'english_slide_guy' and is available at eBay as item # 391014152164. As I started scrolling down, I thought it was going to be a Futurliner, until I saw the motorhome the Caddy landed on. I don't get the feeling, although I could be wrong that the picture is from Europe since the road seems to wide and to have a large boat with fins sitting in a driveway doesn't ring true. The Caddy is what's parked in the driveway across the street - the Nash (or whatever it is) is what landed on the roof of the bus to become a cupola (which, BTW, has its own windshield wiper that I forgot to mention). The slide comes from England and the vendor specifically mentions the bus as being American. I questioned the location myself but I guess we have to take the seller's word. Don't forget that there are Americans who have moved abroad for whatever their reasons and feel very much more at home with American cars - the Cadillac in the driveway may well belong to the owner of the bus. BTW; speaking of American cars in far away places; I'm hoping that our renewed talks with Cuba come to some reopening of the island to trade with us because if they do I'm going to put my order in now for the first available 51 Cadillac that goes up for sale there. Makes a heck of an observation deck, like on the old luxury RR observation cars or the upper deck of a 747. Since I don't see a steering wheel (unless it's obscured by the glare) is it a possibility that the driver drove this vehicle from the upper deck similar to the first generation Pickwick Night Coach? I really don't think so merely because that would have been a major engineering project - the guy is a little off the wall here but I don't think he's that crazy - although it would be interesting to drive it that way (actually, that's why I drive a Range Rover so I can sit up high and see more of the traffic around me). I mean, think about it - if he were driving from the roof he would have to have a steering column, brake linkage as well as wiring harnesses that would have to travel straight down through the main compartment which really wouldn't look very nice to say the least! The steering wheel is most probably where you would expect it to be but is hidden due to the poor quality of the photo. Anyway, Happy New Year to you.